Elle has LOVED music since the time she was just a couple of weeks old. She was crying in the car one afternoon, so I put a Patch the Pirate CD in, and literally the second she heard the little twinkling sound at the beginning of the CD, she stopped like someone had flipped a switch. It worked every single time we got in the car (she really didn’t like riding in the car! ), it was remarkable… we joked that Patch the Pirate was actually a magician. So now it is 4 years later and she still loves to listen to her CDs in the car, while she plays in her room, and nearly every night in bed. She’s also pretty particular about which CD she’s in the mood to listen to and when. She was spending a good part of any car ride bummed out about her CD of choice being in the other parents’ car or at home. So what would any good Mom who would rather listen to Patch the Pirate than her 4 year old whine do? Make a CD case and make it the child's responsibility to have the CD she wants when and where she wants it, of course! 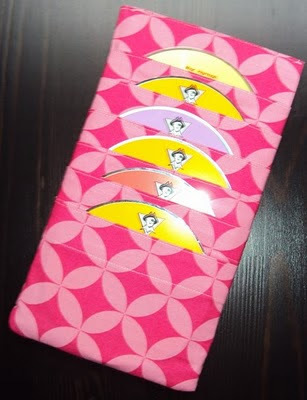 It holds 12 CDs, 6 on each side (just enough for Elle's Patch the Pirate and Music with Mar collection... BTW have you noticed the Music with Mar link that's always at the bottom of my blog??). The pattern was pretty straight forward; I didn’t make any changes to it at all. It came together quickly during Elle’s nap one afternoon & I can atest to how durable it is... Elle carries it everywhere! Now I’m just waiting for her to figure out what an iPod is!